Diary of a Ledger: Final Fantasy VII - by Tobs... not me. Final Fantasy VII - by Tobs... not me. This is the second time that a post has inspired someone to pick up their keyboard to write something for the blog. Tobs is a friend from work who is very much into his gaming but is also a massive Nintendo fan. As you are about to discover. If anyone else ever feels like responding to a post in this way let me know. Like GC, I am a big, big fan of FFVII, but I don't rate it as my favourite game of all time, or even my favourite FF, for that matter, but if there's one game from the FF series that deserves the title of "icon", this one is definitely it. As GC says, FFVII was different from its predecessors because it was in 3D, but there was another difference, which at the time was probably the more seismic one - it was the first FF not be found on a Nintendo platform. FFI-III had been on the NES, and IV-VI had been on the SNES, and up until that point, Squaresoft (as they were then) were seen a massive ally for Nintendo, to the extent that they were even given the cherished Mario IP to go and work on (the result was the fabulous Super Mario RPG, with then gave rise to the Paper Mario series), at a time when they even more zealous of their own franchises than they are now. Then, when the N64 came out, and Nintendo went against the prevailing market and kept faith with a cartridge based system, Square found that their ambitions were too big to contained in this way. The reaction from most Nintendo fans to this was probably the same one you'd get from GC if you told him Steven Gerrard had signed for Man City - one of utter betrayal - and this was before the internet was the totally pervasive medium it is today. There is no doubt though - FFVII could not have been done on the N64 - it was just too big (it was spread over 3 CDs, after all), and the decision to move over to the upstart Playstation platform was a real shot in the arm for Sony - here was a well established franchise (in Japan and the US at any rate, but not in Europe, we never got a "proper" FF before VII) that was suddenly an exclusive for them! This was clearly not lost on Sony, who took on publishing duties, and made sure that the world knew what this game was, and, lo and behold, they had a megahit on their hands. 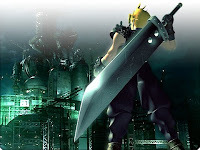 Just as FF1 had pretty much saved Square from the brink of going under (their then rival Enix's Dragon Quest franchise was kicking arse in Japan at the time), so FFVII allowed them to take it to the next level (and ultimately merge with Enix to form the Japanese powerhouse Square Enix, who now also own Eidos). One funny thing about the Sony relationship is that in the PS1's infancy, Sony's VP said that he didn't want any RPGs on the platform as they wouldn't "flatter the system" - he didn't stay much longer after that! As with Gray, it was the first JRPG I'd ever played, and I actually played the PC version (yup, VII and VIII were converted for PC) after a demo made its way on to the cover CD of a PC mag, and my attention was immediately grabbed (for those of you wondering, the bit they demoed was the walk over the mountains and the old rollercoaster track towards Corel). The game didn't want to work at first, to the extent that I had to download a beta version of DirectX 5 (ah, those were the days!) to actually get the thing to run! Thinking back on it, it's probably the first RPG of any kind that I played for any meaningful length of time, as I'd never got into DnD or anything like that. If any game, or game series, illustrates the difference clearly between JRPGs and Western ones, it's probably this one: Yes, there are side quests (and plenty of them, with two optional characters, two optional bosses - both bloody hard - and lots more besides), but the end result is always pretty much the same, and the game is actually fairly linear overall; your character is set, and there's not much you can do to change him (or her). The emphasis is on telling a very detailed, at times convoluted, story, which is almost entirely set in stone. Compare it with western RPGs (which nearly all owe a huge debt to DnD), and a lot more choice and decision making comes into things: you'll probably choose whether you're a man or woman, species in some cases, job, the god you follow, and whether you're a good goodie or a badass. Through the game, you may end up making decisions that will change the outcome of the game, and how good or bad you stay. Oh and cutscenes: the FF series loves it cutscenes, whereas most of the story in western games is told in-game. Is one better than the other? Not for me to say; you get a lot of people who get frustrated with the JRPG/FF way of doing things, and I can understand that, but I still love them. FFVII's story-telling is great, once you get into it; many seasoned gamers will tell you that FFVII was the first game they cried at; if you've played it, you'll know what I'm talking about, and if you haven't I won't spoil it, though you're probably never going to play it if you haven't already. The magic/ability system (Materia) is one of the most straightforward ones to follow from the FF series, and you can quite happily go through the game without doing any of the really "nerdy" stat adjustments (using Tabs and things)- I know this because I didn't use them at all the first time I played through it, being clueless as to their use! Is it perfect? In a word, no. The Western version suffered from some very bad translations, for one thing, which is something that Square have finally got better at doing. That's probably the biggest criticism I can have of the game itself though. What is more annoying is the status that the game has gained for itself (and I'm not blaming Square solely for this - there are many thousands of emo kids responsible too) as the God of RPGs, which explains why Square Enix have revisited the IP 3 times since. Funnily enough, the next one in the series got even more emo in a way, and actually ends up like a series of Dawson's Creek, probably my least favourite in the series, that one. My choice for favourite FF always gets some funny looks, as it's the decidedly retrospective FFIX. After I played VII on the PC, I started dabbling in SNES emulation, and found IV, V and VI online, and I loved those, and IX in very much in their mould (well, IV and V anyway). Amongst the high and mighty critics who have followed the series from the word go, VI usually is lauded as the one to beat, and I'll be very surprised if Square Enix don't end up re-making it for DS, as they have done with III and IV. Yet, out of all of these, my favourite JRPG isn't even a FF; it's still made by Square, mind you, and it's the absolutely stellar Chrono Trigger. It was never released in the UK until last year, when the DS version finally came out (and it is the best version by far, as it includes the cutscenes they made for the PSX version, but actually runs smoothly). If you've got a DS, and have any interest in JRPGs at all, you really owe it to yourself to play it. When Sony showed a demo of the FFVII intro re-made for PS3 before the console's release, the FFVII fanboy community probably all creamed themselves; yet still, Square Enix show no sign of them taking this concept - they have got enough on their plate right now anyway, with FFXIII getting Japanese release in December, and then (shock horror!!) the 360 and PS3 release over here next year - oh, and a side note to the Sony fanboys accusing Square of selling out for doing this: get over yourselves, it was never truly your series in the first place! They're also working on FF Versus XIII, which remains PS3 exclusive (for now at any rate), and even FFXIV, which, like XII, will be an MMORPG. Still, if they find themselves short of a few trillion yen, all they need do is re-make FFVII for 360 and PS3, and they'll be set for the next 20 years - just give us a good translation, properly rendered environments, and some good voice-acting, OK guys? This has gone on way longer than I originally planned, and I apologise for boring anyone who reads it, but the FF series, and VII especially is a subject I have a huge interest in. Gray and I have a bit of banter at work as to what makes an icon, and what doesn't (and I still feel that Death is an icon), but on this I can have no doubt at all: it's not perfect, but is it iconic? Abso-frickin-lutely! Thanks to Tobs for this. Great post. Shorter next time though yeah? Thanks mate. Sorry about the length - got a bit carried away!